Your guide to finding the perfect Valentine’s treat for that someone special. I am obsessed with cupcakes (to the extent of dressing up as one for Halloween) and have tried almost every cupcake shop in Philly. If you’re as obsessed as me, you’ll understand that this bakery is one of the best cupcake bakeries in Philly. The original Brown Betty store is located in Northern Liberties, but there is also a shop in Liberty Place. 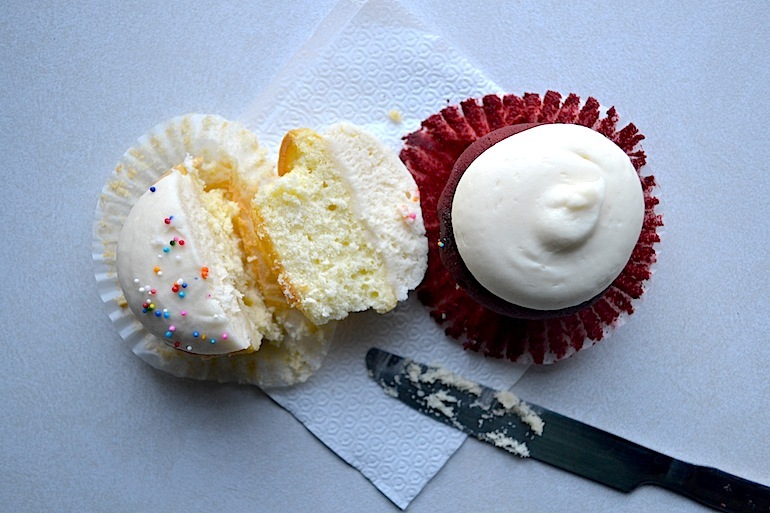 Brown Betty’s moist, decadent, fluffy cupcakes will surely satisfy your special someone’s sweet tooth. There’s an original flavor for everyone, and they even have fun names, such as Hattie Don’t Play instead of double chocolate or Jean’s Road Trip for the red velvet. Don’t be skeptical about cupcakes as a Valentine’s treat–they’re a great, delicious, and the perfect alternative to the typical chocolate box and flowers. PLUS they sell them on campus. Nuf said. Located in Reading Terminal Market, this chocolate haven has endless chocolatey options that make for the perfect gift (or a good reason to go on romantic excursion). 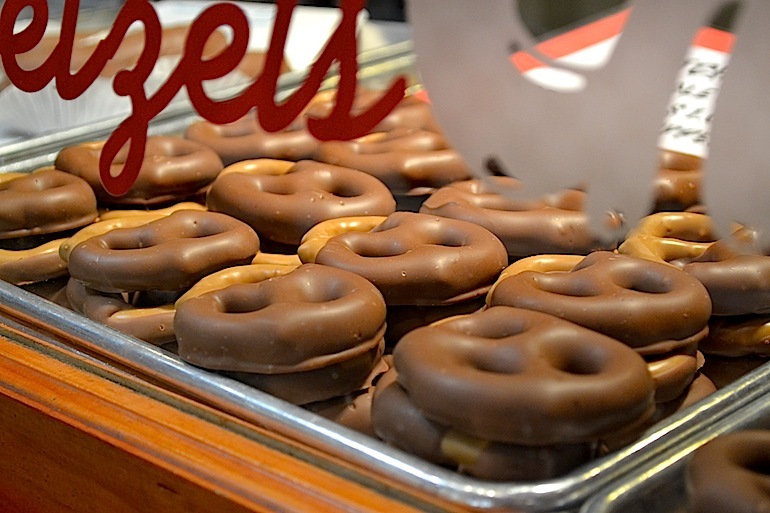 My favorite, the chocolate peanut butter pretzel, perfectly combines sweet and salty tastes into each crunchy and savory bite. The shop carries an assortment of treats that range from non-pareils to chocolate covered fruits to endless sugar-free chocolates. If you’re looking for something Valentine’s themed, the heart shaped chocolates will definitely give your friends’ or signification others a giddy, sappy feeling inside. I come from a family with many allergies, so I know how hard it can be to find allergy-free baked goods. When you do, they’re often times mediocre at best. Sweet Freedom Bakery, however, is not only completely gluten-free and vegan, but also better than most bakeries in Philly. The banana chocolate chip cupcakes are moist and delicious, with bursts of fruity and chocolate flavors in every bite. 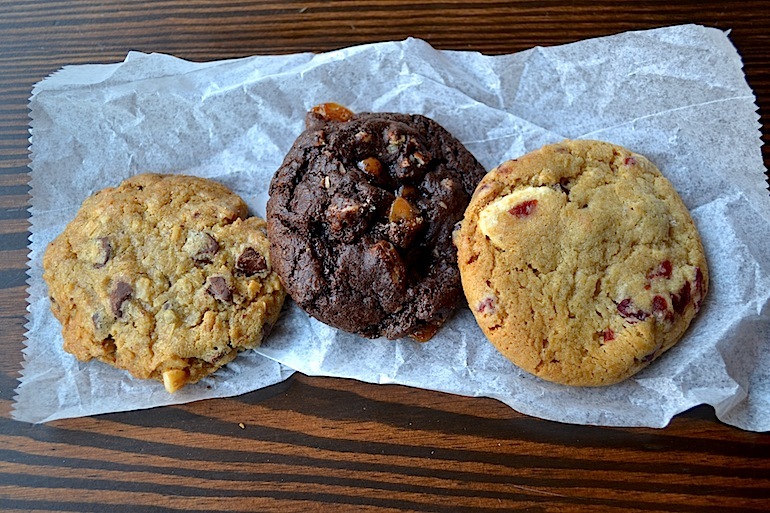 It also carries an amazing selection of cookies, muffins, donuts, breads and other delicious desserts. The apple cider donuts and cake balls are sure to satisfy anyone’s sweet cravings. Who would’ve thought that such a tasty assortment could be made without butter, milk and eggs? (Definitely not me). Even when it’s so cold outside that your fingers and toes lose all of their feeling, I bet you, like me, still crave a creamy, cold, bowl of ice cream. Whether you want a simple scoop of mint chocolate chip or a bizarre creation of peanut butter, pretzel, fluff and chocolate frozen yogurt, Scoop de Ville is the place to go. Scoop de Ville has its very own twist on the flurry by using a special machine to mix any variety of candies, syrups and fruits into ice cream so you get to create your very own personal ice cream flavor. Scoop de Ville also has a large interior store, perfect for the chilly Valentine’s day weather.